Pattern is now posted. Click here for free pattern. Please note: Fabrics mentioned in this post are no longer available in the shop. I've made my favorite hat for spring! I know it may be snowing today where you are. But we've had a few warm days here in NYC. And what better way to greet the new season than with a fun hat, ready to go. My Seams Like Spring hat is halfway between a toque and a slouch. It's light and lacy, fun and easy. And it's got good seams! Admittedly, I tend to get all hung up on seams. But why not? Seams hold our garments and accessories together. Straight or perfectly curved, seams define the article of clothing. With lacy knits we need our seams to be sturdy and have just the right amount of stretch. Seam allowances on sweater knit fabrics need to be finished in some way to keep the edges from fraying. Yes, finding a good seam finish for a lacy sweater knit is tricky. I couldn't have a heavy seam on an openwork hat. Since there's no way to make the seam invisible, it had to be part of the design. After a little fun experimentation, I found the seam and seam finish that I'm happy with. 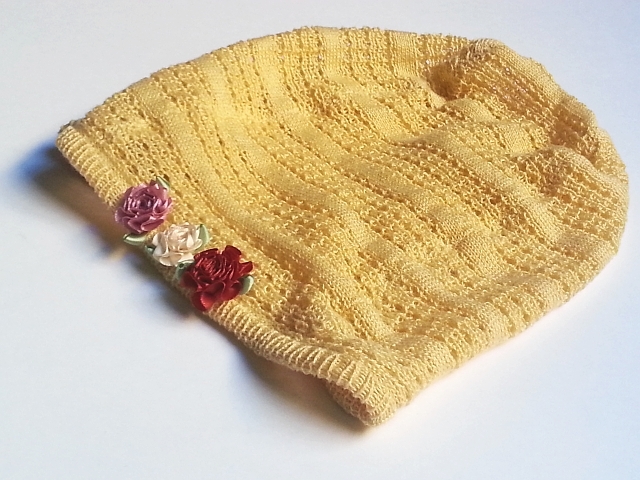 It's lightweight and works for the Seams Like Spring hat. I know I'll use it again sometime! And then I realized that this is the perfect, starter project! If you've been avoiding working with stretchy, springy, (Dare I say "unstable"?) lacy sweater knit fabrics, here is the project for you Next week I'll be posting a step-by-step tutorial on how to work with lacy sweater knit fabric to cut and sew your own Seams Like Spring hat. I used my Springs pearl cotton lace-like sweater knit, but any lacy, springy sweater knit will do. Moonstone would work. (ETA June 2016 Saratoga Rib is now available and would work beautifully for this project. You can even upcycle an old lacy summer shell or sweater. I drafted the single pattern piece (It's used four times for this hat.) so that the seams provide stability. The fabric is cut so that the direction with the least amount of stretch goes around the head. I'll provide the (free) pattern piece via pdf download next week. 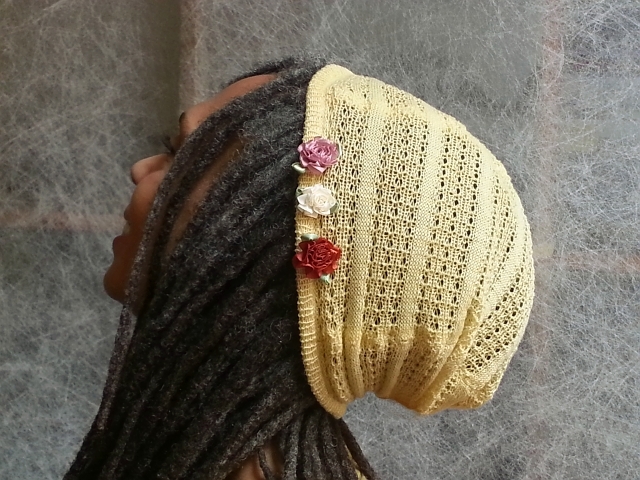 If you'd like to greet spring in style, or if you just want to practice seams on lacy openwork fabric and have something pretty to show for it, give the Seams Like Spring hat a go! You'll also need your standard sewing equipment: a sewing machine equipped with a ball point needle, scissors (or other cutting implements), a steam iron, your favorite marking tool, and straight pins (preferably ball point). No heavy duty stabilization methods are required. If you're feeling nervous about your unstable fabric, have a can of spray starch handy. And no serger is necessary! 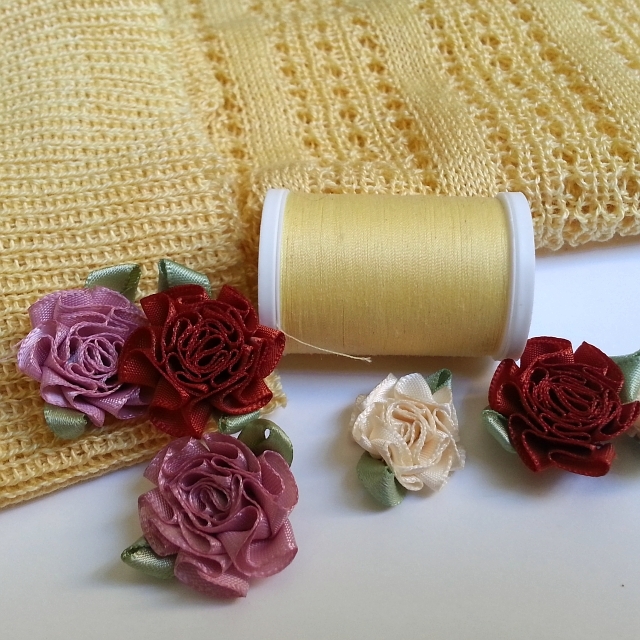 The tutorial will also include my favorite way of binding an edge with sweater knit fabric. Pattern is now posted. Click here for free pattern. Cute hat! I might actually try this one!